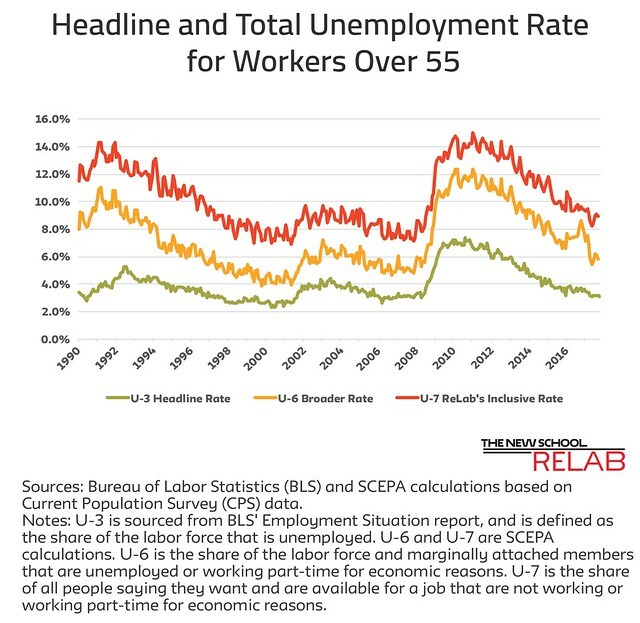 The Bureau of Labor Statistics (BLS) today reported a 2.8% unemployment rate for workers age 55 and older in May, a decrease of 0.2 percentage points from April. The economy is expanding, unemployment is low, and wages are growing. But wage growth for workers over 55 is slower than wage growth for younger workers. Why? Older workers are more likely to get stranded in stagnant regions earning low wages - they are only 17% as likely to move for a job compared to younger workers. Economic growth varies by region due primarily to differences in types of industries. If their local economy slows down, older workers face higher costs of moving for a better job; they are more likely to own homes and have deeper family networks and community connections than younger workers. Older workers also have fewer working years to recoup the costs of moving. Immobility is a source of a labor market condition called monopsony power, which leaves older workers with less bargaining power and allows employers to suppress wages. The nation needs to offer older workers trapped in bad jobs a path to a secure retirement. Strengthening Social Security and creating universal, secure retirement accounts will allow all Americans access to dignified retirements after a lifetime of work. Guaranteed Retirements Accounts (GRAs) are a proposal for individual retirement accounts funded by employer and employee contributions throughout a worker’s career paired with a refundable tax credit. Better pensions help older workers gain bargaining power in the labor market.